EDITIONS: This book is available in paperback in 5.5" x 8.5" (portable size), 8.5" x 11" (large size), and as an eBook. This 5.5" x 8.5" edition is the most portable, while the details of the figures - including the periodic tables - are most clear in the large size and large print edition. However, the paperback editions are in black-and-white, whereas the eBooks are in color. 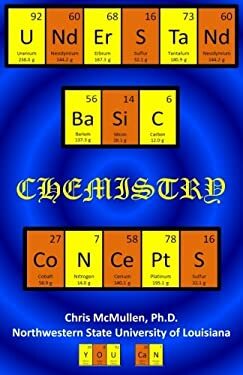 OVERVIEW: This book focuses on fundamental chemistry concepts, such as understanding the periodic table of the elements and how chemical bonds are formed. No prior knowledge of chemistry is assumed. The mathematical component involves only basic arithmetic. The content is much more conceptual than mathematical. AUDIENCE: It is geared toward helping anyone - student or not - to understand the main ideas of chemistry. Both students and non-students may find it helpful to be able to focus on understanding the main concepts without the constant emphasis on computations that is generally found in chemistry lectures and textbooks. CONTENTS: (1) Understanding the organization of the periodic table, including trends and patterns. (2) Understanding ionic and covalent bonds and how they are formed, including the structure of valence electrons. (3) A set of rules to follow to speak the language of chemistry fluently: How to name compounds when different types of compounds follow different naming schemes. (4) Understanding chemical reactions, including how to balance them and a survey of important reactions. (5) Understanding the three phases of matter: properties of matter, amorphous and crystalline solids, ideal gases, liquids, solutions, and acids/bases. (6) Understanding atomic and nuclear structure and how it relates to chemistry. (7) VErBAl ReAcTiONS: A brief fun diversion from science for the verbal side of the brain, using symbols from chemistry's periodic table to make word puzzles. ANSWERS: Every chapter includes self-check exercises to offer practice and help the reader check his or her understanding. 100% of the exercises have answers at the back of the book. COPYRIGHT: Teachers who purchase one copy of this book or borrow one copy of this book from a library may reproduce selected pages for the purpose of teaching chemistry concepts to their own students.